If you own a business, you know that keeping your Triangle company’s documents and electronic files protected from intruders or natural disasters is vital to the success of your business. That’s why it’s important to keep your safe or vault in excellent condition — whether you’ve forgotten the combination to your safe or need a new safe installed in your commercial space, the professionals at Marshall’s Locksmith are happy to serve commercial clients in Raleigh and surrounding areas with a variety of safe and vault services. Marshall’s Locksmith has X-09 Certification, so we’re government-certified to install, operate and program X-09 safe locks. Interested in a safe or vault for your Raleigh business? At Marshall’s Locksmith, we offer a variety of security products from quality brands like American Security Products, Gardall, Protex and A&B. 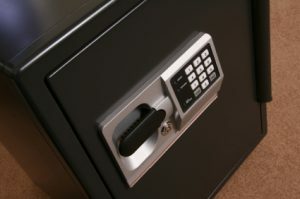 We even have used safes for sale — come visit our indoor showroom and browse through one of the largest selections of safes in the area, as well as a variety of other security products, automotive products, lock products and much more. We’d be happy to help you find a safe that perfectly fits your company’s needs. To speak with a licensed Raleigh, NC locksmith, call us today at (919) 231-8017! Whether you’re interested in our Raleigh safe installation services or need a heavy safe moved from one room to another, our staff is here to provide professional, efficient service to meet all your commercial security needs in the Triangle and beyond. Marshall’s Locksmith specializes in safe and vault services, proudly serving residential and commercial customers in Raleigh, Durham, Chapel Hill, Cary, Apex, Garner, Wake Forest, Knightdale, Wendell, Zebulon, Youngsville, Clayton and surrounding areas throughout North Carolina.